Authors: Lisa Sokol Ph.D., Steve Chan Ph.D. The growing complexity of electric power grids requires innovative solutions to effectively manage power grids and to enhance grid security and stability. Predictive modeling software can use the historical data to discover, among other things, failure order, failure relationships to components, and predictors associated with failures. 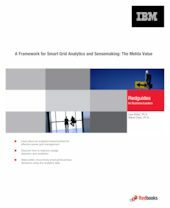 This IBM® Redguide™ publication proposes a dedicated ad hoc synchrophasor network that is embedded within the smart grid. This synchrophasor is a device that can measure, combine, and analyze the time-stamped measurements from various locations on an electric power grid. The proposed Smart Grid Analytics and Sensemaking framework is based upon various devices, data, and analytics. A smart grid is really an ecosystem of large interconnected nonlinear systems. This proposed solution instance focuses the use of context-awareness analytics to maintain correct values (current and historical) for nodes and edges. Key to the analytics is the use of the Mehta Value, which is composed of a base reference, drift, and context-referenced phase angle data. Real-time decisions, such as load shedding or pathway selection, can then be made based upon the combination of contextually correct data and analytics, such as the Mehta Value. The streaming data within the electrical grid can be used automatically by various Smarter Grid Analytics.